Unveil Secret Symbol Wins With Sloto's New Game 111% Match + 33 Free Spins! Mr. Sloto’s heart is filled with a deep ocean of secrets – but worry not, he won’t be keeping these from you! Especially when it comes to unveiling his brand new slot Secret Symbol and a 111% Match + 33 Free Spins! Spin the 25 paylines of this exciting slot where the Aztec Chief icon works as the Wild symbol and when it appears on reels 2 or 4 will cover the entire reel for extra wins! Land 3 or more scattered Pyramids and claim Free Spins with multipliers as high as 20 times your bet! 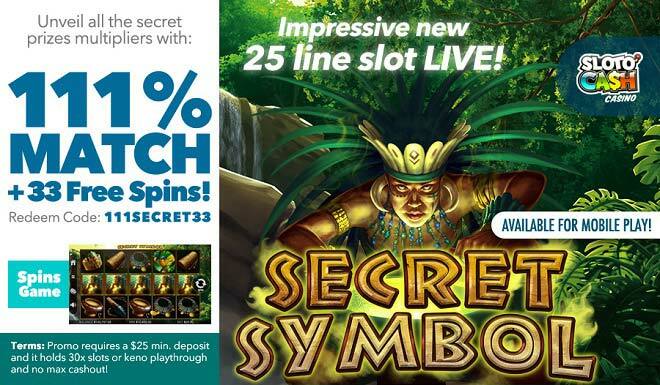 Mr. Sloto would like to make public his latest hush-hush: make a deposit of as little as $25 and play his latest slot Secret Symbol with a 111% Match + 33 Free Spins!